I love going to London and finding fun and cool things to do there. 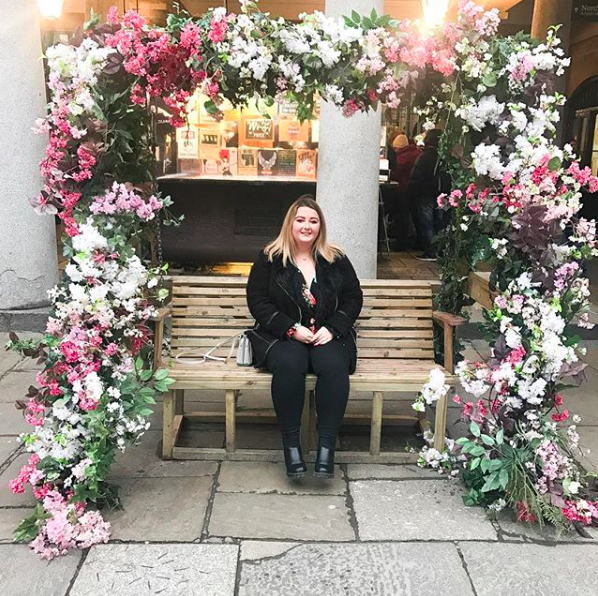 Last month I found out that there was a London themed afternoon launching at the Town House in Kensington, boasting savoury and sweet London-inspired food, so I knew I had to go! 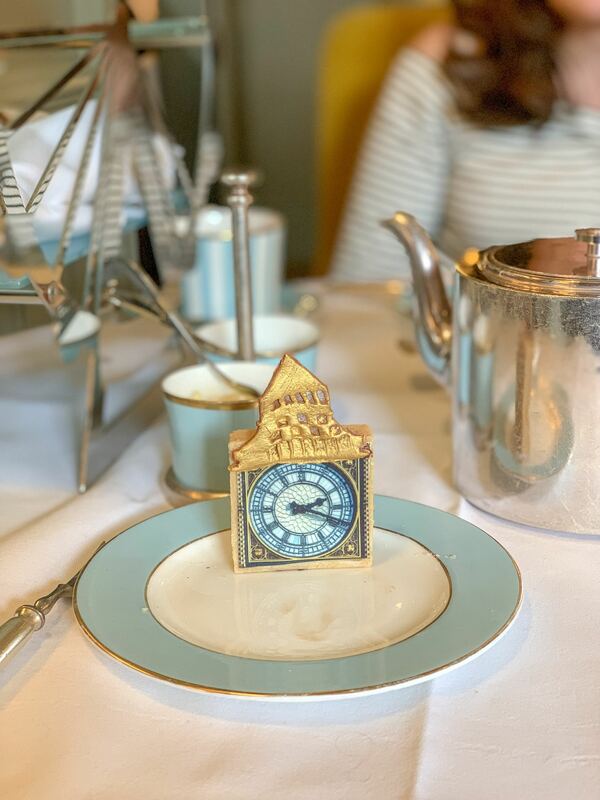 The London Landmark Afternoon Tea is presented on a London Eye-inspired tea stand, paying homage to the capital’s iconic buildings: The Shard, The Gherkin, a London telephone box and Big Ben. 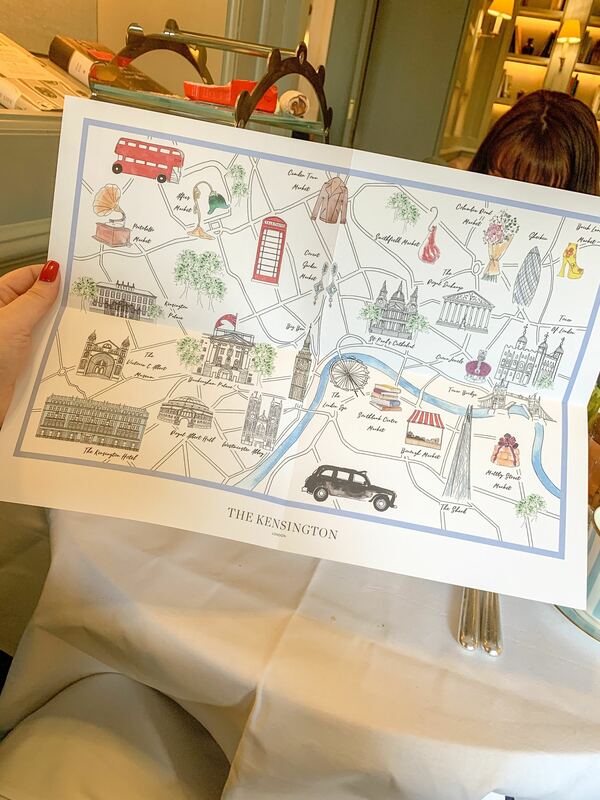 The afternoon tea is served alongside a bespoke map of London, with the journey and menu explained to you briefly with lovely little illustrations detailing where the menu draws its inspiration from. 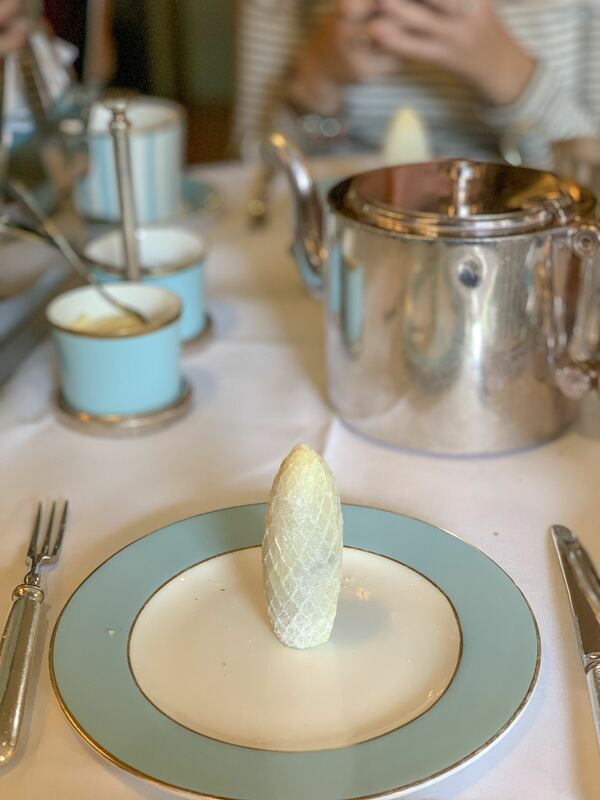 We sat comfortably at our table in plush mustard chairs, before being talked through the journey of the London Landmark afternoon tea. 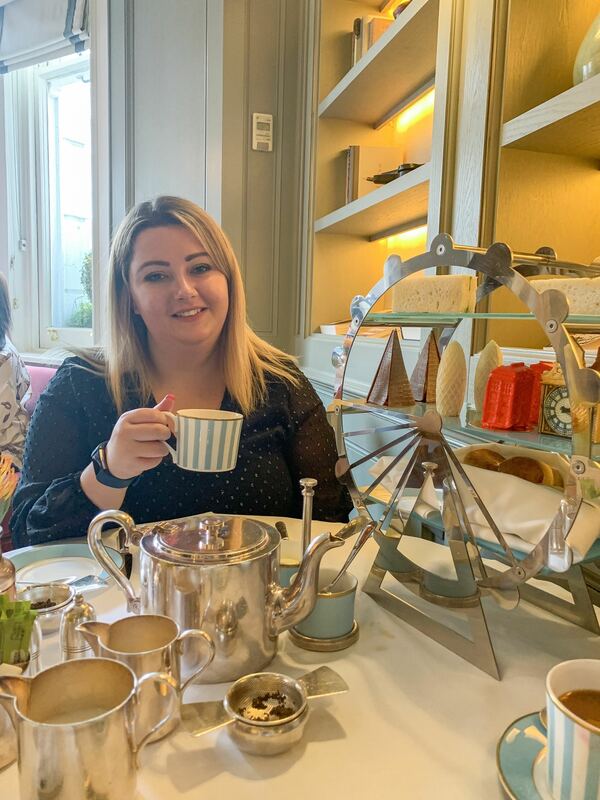 We looked through a drinks menu with lots of different teas to choose from, but we kept it simple and ordered a traditional English breakfast tea each. 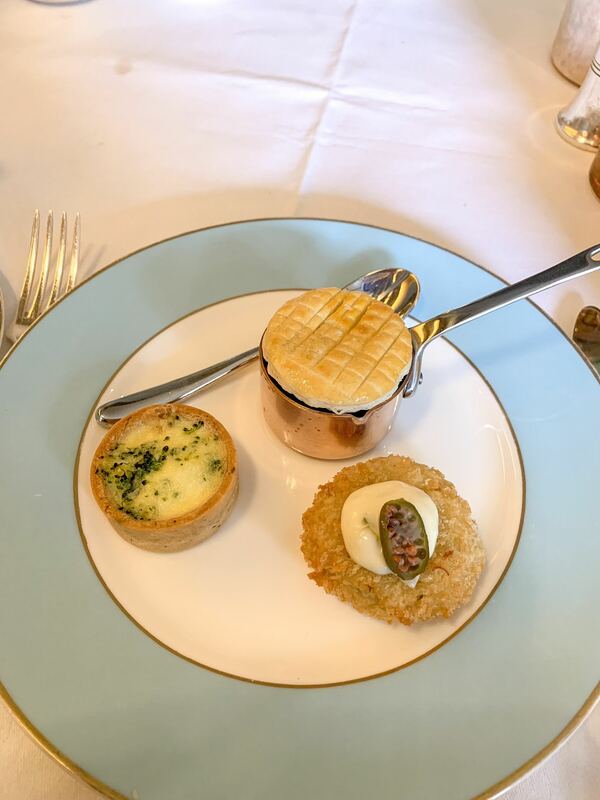 The afternoon tea started with a small plate of savoury treats; Colston Bassett stilton & broccoli quiche, steak & London ale pie and a crab cake. I loved these little savoury treats, especially the crab cake which was packed with flavour and a lovely crunchy crumb coating. The mini steak pie served in a tiny metal dish looked super cute too! The table was cleared and we were brought out the main afternoon tea, presented on a beautiful London Eye-inspired tea stand. On the top shelf there were Campbells & Company smoked salmon, coronation chicken and egg, cress and marinated cucumber sandwiches. My favourite sandwiches were the salmon ones – so I nabbed Jade’s one and she had my Coronation chicken one! 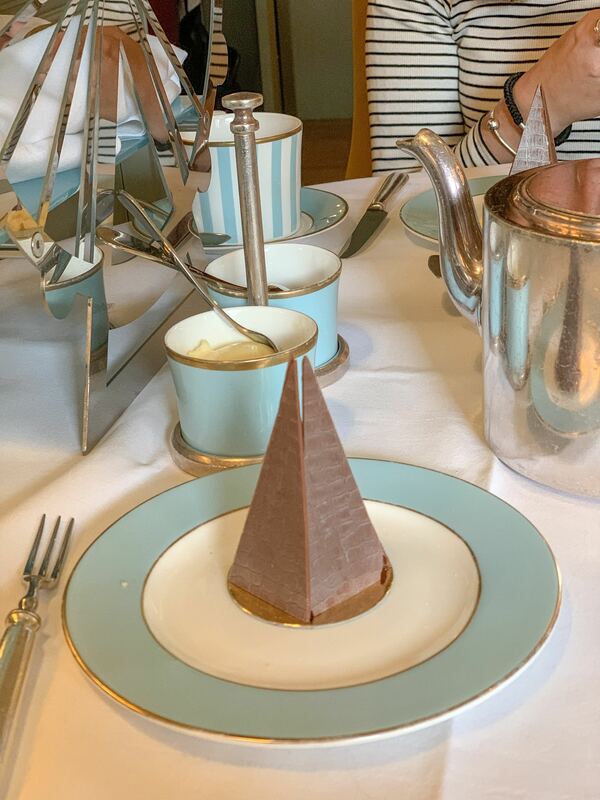 The next tier down was the best part of the afternoon tea; the London landmark shaped sweet treats. The Shard was a carrot cake with milk chocolate shards, The Gherkin was a white chocolate shell with dark chocolate ganache inside, the London telephone box was a rhubarb mousse and Big Ben was a lemon curd tart with an edible picture of the Big Ben clock face. All the London landmark sweet treats were delicious and just the right amount of sickly. My favourite has to be The Gherkin; the white chocolate shell was tasty and the rich chocolate ganache inside was deliciously sweet. The Big Ben lemon curd tart comes a close second – I could’ve happily eaten more of those! 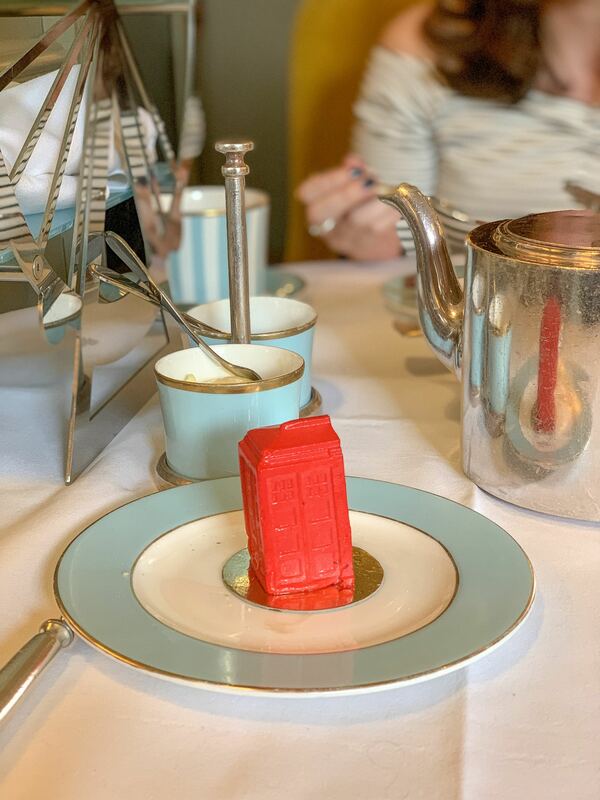 My least favourite has to be the rhubarb mousse London telephone box, as it lacked in flavour and taste. Fit to burst we still had one more tier to dive into – warm plain and fruit scones with jam and clotted cream. I managed half a fruit scone with cream and jam on top (it HAS to be cream first!!) before admitting defeat. The food offering is amazing on this afternoon tea, in terms of value for money and taste. 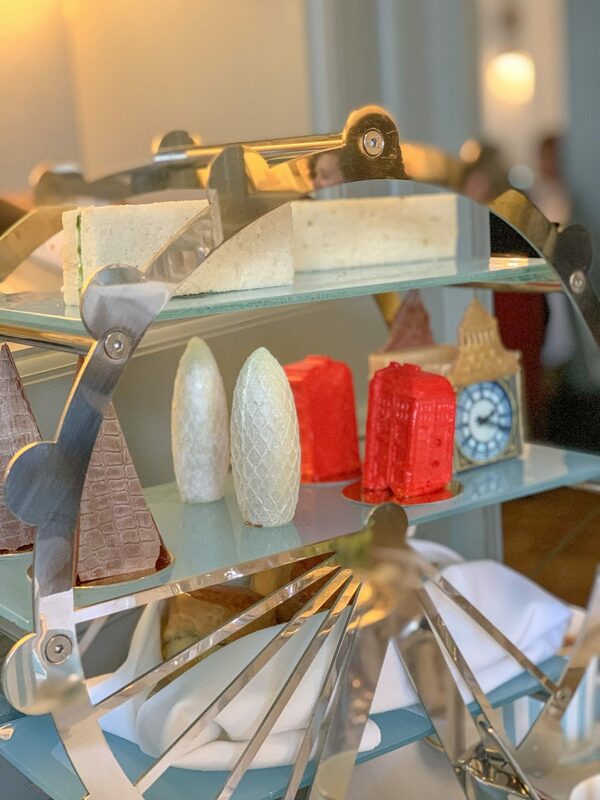 Afternoon teas can often seem expensive for a few small sandwiches and cakes, but Town House really pushed the boat out on this one. I think it’s a fantastic afternoon tea and would happily go again, and £42 per person is well justified in this case. The location is luxurious yet welcoming too, and the waiters were friendly and really attentive. 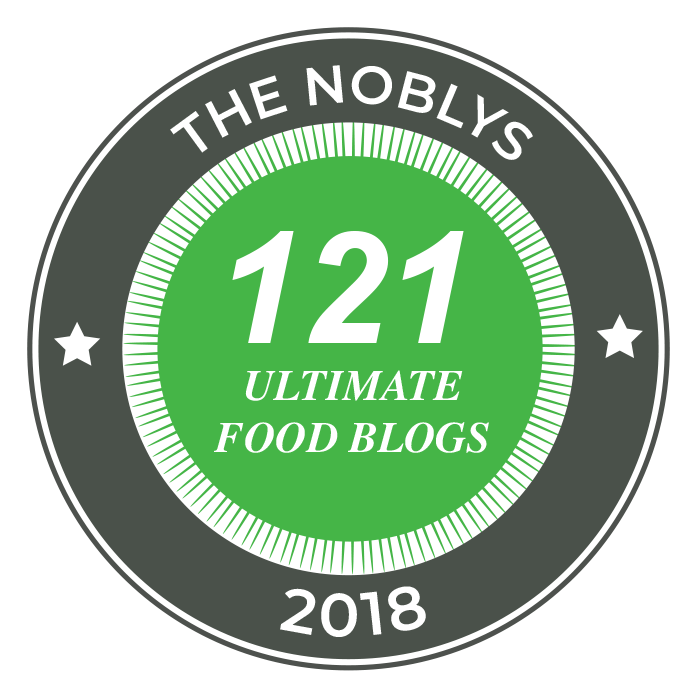 The food was incredibly tasty and if you’re feeling extra fancy, for an extra £12.50 you can add a glass of champagne to the afternoon tea, so it’s a great treat to share with friends or family! 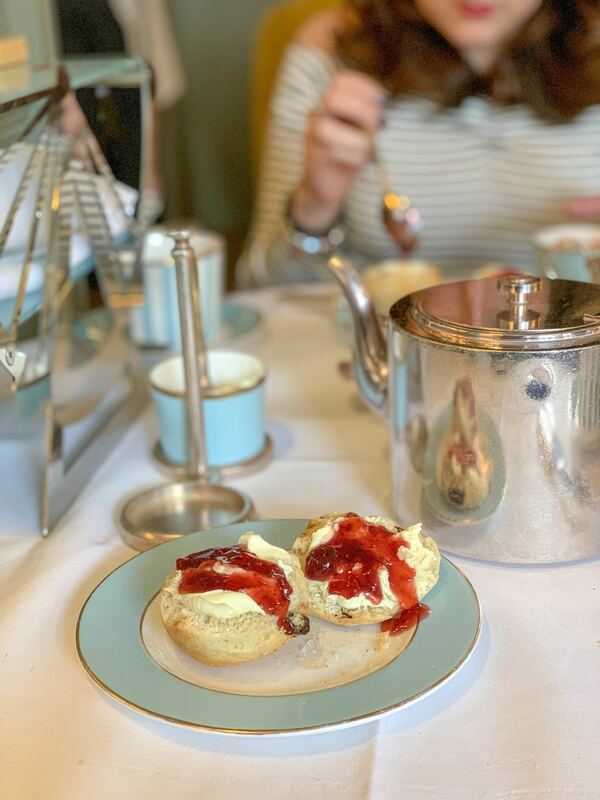 What’s the best afternoon tea you’ve ever had? Those cakes look amazing! They have so many details, just wow. This looks delicious. I love afternoon tea but never get a chance to go. I’ll have to find a Saturday in the future to make my way over to Kensington.